In an effort to minimize inconvenience, the Georgia Department of Transportation (GDOT) conducts most road construction and maintenance without closing roads to traffic. This poses a traffic hazard to drivers and their passengers, as well as the crew members working on the road. Over half of all fatal injuries to road workers are caused by being struck by a motor vehicle, and a third of these by vehicles intruding into the work space. Since 1973, 60 GDOT workers have lost their lives in work zones. However, motorists are more likely to be killed or injured in work zone crashes than GDOT workers. The general public accounts for 82% of work zone fatalities nationwide. Highway work zones are defined as portions of a highway or street where construction, reconstruction, or maintenance work is being done to the road, its shoulders, or any other areas near the roadway. This definition also includes mobile work such as underground and overhead utility maintenance, snow removal, and land surveying activities. Highway work zones are set up according to the type of road and the work to be done on the road. Signing, roadway markings, and flaggers are used to direct drivers safely through work zones or carefully marked detours. Motorists are responsible for knowing how to read and react to these directions. Paying attention and driving cautiously and courteously are the most important steps to preventing crashes while driving through a work zone. Watch for the color orange. It means road work. Warning signs in work zones have an orange background and black letters or symbols. They are used with other traffic control devices or flaggers to help direct traffic safely through work areas and to protect drivers, their passengers, and highway workers. For safety reasons, the speed limit in most work zones is reduced. If the speed limit is not reduced in a work zone, drivers should obey the normal posted speed limit for the road on which they are traveling, but be more cautious of road conditions, lane position, and the presence of workers. Advisory speed limits are used to identify safe speeds for specific conditions within a work zone. These black and orange signs are always used with warning signs. Official speed limit reduction requirements will be indicated with the standard black and white speed limit signs. Motorists who disobey regulatory speed limits in a work zone may be found guilty of a misde­meanor of a high and aggravated nature and will be punished by a fine of not less than $100.00 nor more than $2,000.00, or by imprisonment for a term not to exceed 12 months, or both. 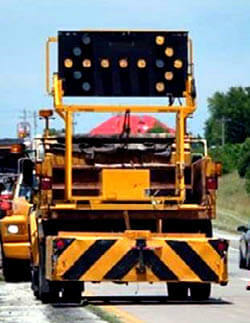 Flaggers are people used to direct traffic through and around work zones. In a work zone, a flagger has the same authority as a regulatory sign. Do not disobey a flagger’s traffic control directions. Work vehicles and heavy equipment will typically have flashing or revolving amber lights. You must yield the right-of-way to these vehicles. Reduce your speed as you approach any work zone where vehicles have amber lights displayed. Travel lanes are likely to be closed in work zones, and lane patterns may change as the work progresses. Sometimes, workers must operate within inches or feet of an open lane of traffic. When lanes are closed or narrowed, or workers are operating on the roadway near traffic, change lanes away from them if possible or shift slightly within the boundaries of your lane to give added distance between your vehicle and the workers. This will provide extra protection for you, your passengers and the workers along the roadway. Some road work can be performed without actually closing lanes of travel. Pavement maintenance, debris removal, paint striping, utility work, and snow removal are examples of work accomplished while moving in traffic. Vehicles used in performing this type of work will have flashing amber lights and may have flashing arrows directing traffic to merge left or right. The vehicles may also display signs for the purpose of directing traffic or indicating hazardous conditions. These vehicles usually work at very slow speeds, such as 5 miles per hour, and may occasionally be stationary in the roadway. For your safety, and the safety of others, slow down, yield the right-of-way to these work vehicles, and follow any directions displayed by the work vehicles. Watch for speed limit signs. Fines are increased in most work zones. Adjust your lane position away from workers. Do your part to help protect the men and women who work hard to make Georgia roads among the best in the nation.